SIVAL is a standard setting trade show for plant production with nearly 600 exhibitors and 19,000 professional visitors annually. The 2014 edition took place in Angers, France from January 14th to 16th. Each year, a select number of trend-setting innovations receive a SIVAL award. In the category agricultural inputs, the jury recognized the exceptional potential of Biobest’s Flying Doctors® in pollination by awarding the product a SIVAL D’ARGENT. 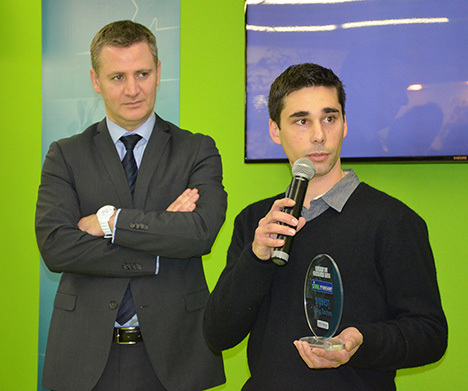 “I’m honoured by this prestigious award” says Loïc Goeäu, General Manager of Biobest France. “SIVAL is a key event for agriculture and horticulture in France and this will help us to better inform growers about the unique potential of our pollination solutions”. Just a couple of weeks ago, a research paper by Breeze and coworkers assessed the shortage of honeybees in Europe to ensure successful pollination of the wide range of crops for which insect pollination is essential. France, like many other countries, has less than 50% of the honeybees that would be required. No wonder that there is an ever growing demand for bumblebees by growers of all kinds of fruits, not only in greenhouses but also in open air. For more information, contact your Biobest representative or distributor.